She can be found near the shortcut porticullis in No-man's Wharf. In Dark Souls II: Scholar of the First Sin her sign is found on the dock near the ship instead. Found near the Hollow Infantry who fires flaming arrows as you enter No-man's Wharf. Only in Dark Souls II: Scholar of the First Sin. No-man's Wharf Boss fight inside the ship. Shaded Woods Mini-boss near the Shrine of Winter. Only in Dark Souls II. Sinner's Rise At the bottom of the elevator, in the second, leftmost room. Only in Dark Souls II: Scholar of the First Sin. Flexile Sentry Soul Guaranteed Dropped from the one in No-man's Wharf. Twinkling Titanite Guaranteed Dropped from the one in the Shaded Woods. Titanite Chunk seldom Dropped from the one in Sinner's Rise. This fight is quite simple: block or dodge his attacks, then attack him while he's recovering. Use the large pillar in the middle of the room to block his advances and force him to attack. It's recommended to finish this fight quickly. Two minutes into the fight (or after the boss is at 50% health), the water in the room starts to rise. The water will only rise to just below the shoulders, but once it gets that far, you will have an exceptionally difficult time maneuvering. After the boss is dead, continue through the next doorway and make sure to open the chest for a Pyromancy Flame. You can then use the ship's compass to sail yourself over to the Lost Bastille. You can buy some Poison Arrows from Lonesome Gavlan to make the fight even easier. 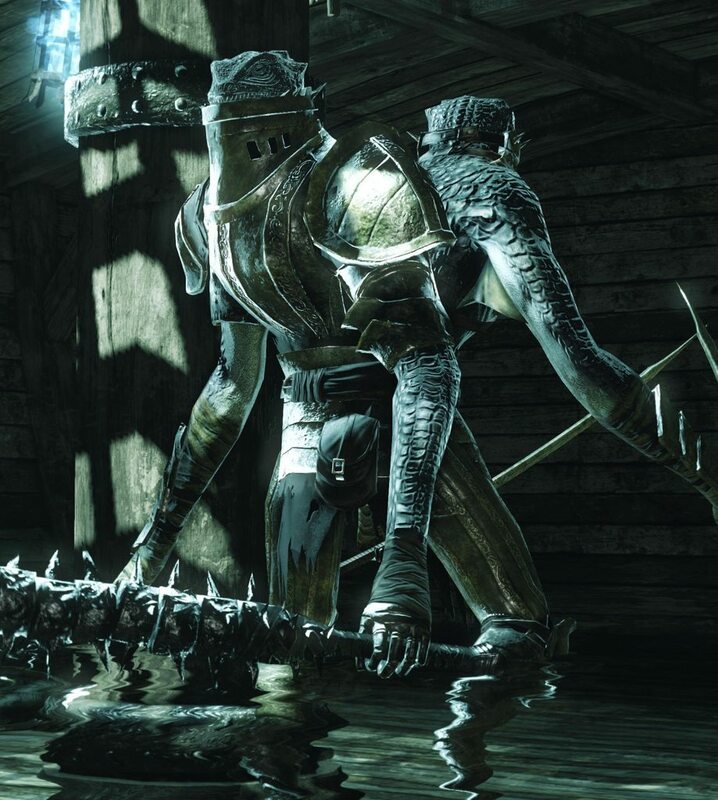 There are two Suspicious Shadows with unique drops in the boss arena in NG+ and beyond. Circling around to its "back" (non-active side) is a sane method of attack - if you time it with its cool-down period after its attack. While on the docks, if you have Lucatiel summoned, make sure her path is clear and that you stay out of her way – she may fall into the water otherwise, depriving you of your phantom before you even reach the boss fog.